Yeah, I know it’s fall an’ all, (the local kids are on their fall break from school) but this pile of photos from last year’s trip to Florida were just asking to be scrapped so what was I to do?? I wanted to use my recently acquired Tim Holtz alpha dies which are slightly larger than his first set released and mess with some molding paste. I started by laying out the dies onto a piece of card stock and taping them in place in order to run through my Big Shot. It was then I realized how useful a 12″ wide die cut machine would be! I might have laid the words out differently had I not been restricted by the 6″ width of the Big Shot rollers. Tim Holtz, if you’re listening to us, here’s your chance to change the world!! Once the quote was cut out of the card stock, I used that as a stencil for my molding paste. I smooshed it onto a 12″x12″ piece of watercolor paper that I had already painted in colors to match the patterned paper I planned to use. All of the papers and stickers on this layout are from the Kaisercraft Fiesta collection and there is much yumminess in this pack! After a summer of physical labor and very little book reading, this layout makes me want to look at flights to Florida again! Thanks for stopping by today! Leave us a comment please, and tell us what you’re reading these days! It has been a long cold winter with way too much of the white stuff. I am wishing for spring. I sat down to make a spring tag and I wanted to use some bright colours. 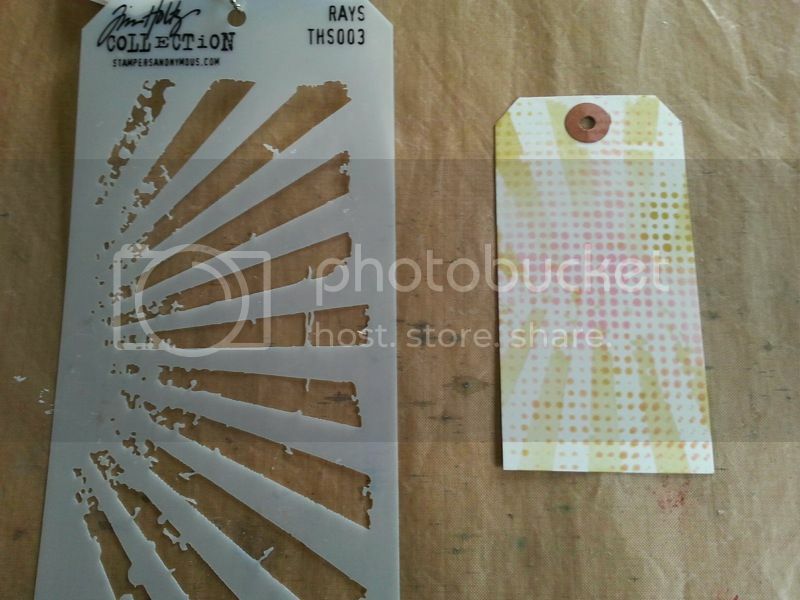 I reached for my trusty Tim Holtz stencils again….. and wouldn’t you know it but dot fade and rays were on top of the pile so those are the 2 that I decided to use (strange what can trigger creativity sometimes huh?) I started with a tag and I just started inking. who doesn’t like to get dirty with distress inks? I laid down the dot fade and coloured it randomly. 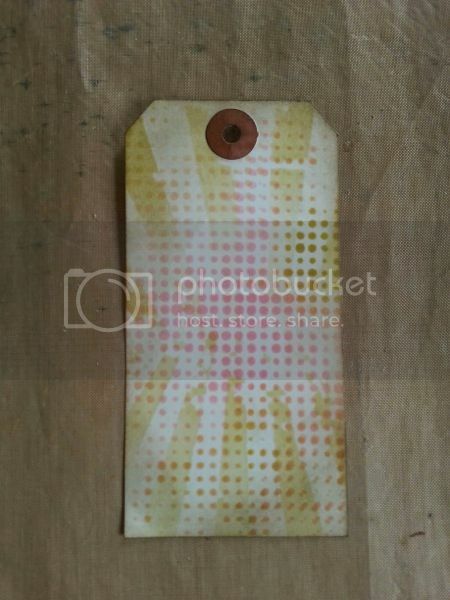 When I was happy with that layer, I added a layer of yellow with the rays stencil right on top. I like the depth achieved when you layer with the stencils. I decided to grunge it down by distress inking the edges with a little brown. I then went to work on the embellishments. I cut a piece of distressed paper with the trellis alterations die from Tim Holtz and then I ripped it and distressed it a little more. I thought it would be perfect for a butterfly to sit on. 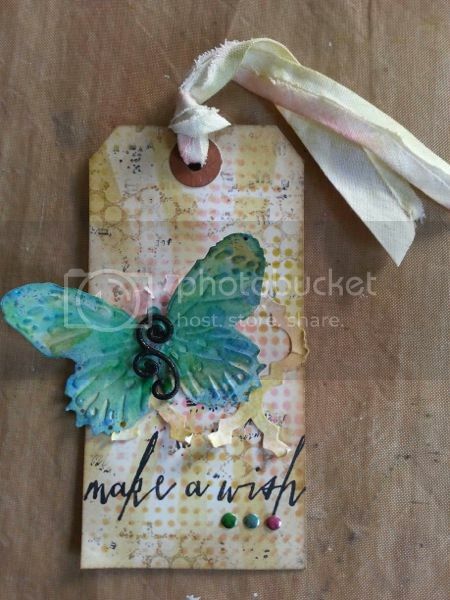 I die cut and embossed a butterfly (Tim Holtz again) and went to work on it. I randomly splotched on blues, greens and yellows onto my butterfly. (dry with a heat gun after every layer of colour that way you see the colours and they don’t all just blend together) I added some stickles around the edges and a black flourish to the centre to complete it. The stamp is also Tim Holtz. It’s from the new release handwritten sentiments. (it’s a great set to have… just sayin’) I added random stamps in browns and black around my tag to grunge it up even more. The blue, green, and pink metallic accents pull all the colours from the tag together and draw your eye to the sentiment. I took vintage seam binding and coloured 1 side with green from the tag and the other side I used the pink. After that was dried with the heat gun it was ready to be tied on and the tag was complete. Now, to grab a cup of tea and head out to the deck to sit in the sun and wish for Spring!